Home » Behavioral Neuroscience » Am I addicted to coffee? Recently over coffee, my friend told me that scientists have been doing drug research wrong for years. He was referring to an article about the effects of social environment on drug taking. In the article, the author criticizes scientists, government, and media for portraying drug addiction without accounting for causes of drug addiction outside of changes that happen to the brain. Not entirely true. There are lots of causes of drug addiction, and it is simple to think science only focuses on the brain chemistry of addicted animals. My friend brought up this issue hoping for an explanation since he knows that I study drug addiction in the lab. I was quick to explain that people use different methods depending on the goal in mind. Specific questions like “What happens to the brain during a cocaine overdose?” or “What happens to impulse control during abstinence from moderate cocaine use?”. To answer each question, we need to use different doses of cocaine and different brain functioning tests. Without knowing the exact question, it would be easy to mistake the experiment’s methods as flawed. But before we dive deeper into methods, let’s consider what we think of as drug addiction. Not everyone who takes drugs becomes addicted. There is a process that involves multiple phases with changing motivations to take the drug, according to prevailing theories in drug addiction (1). Let’s use coffee as an example. When I was younger, I hated coffee because it was very bitter and I saw no benefit to drinking something that tasted like mud. I would have a couple sips from my mom’s mug in the morning and stick my tongue out with disgust. That was before my “coffee addiction” began. Later during college, I realized I could drink coffee, disguising the bitter taste with copious amounts of milk and sugar, and reap the benefits of caffeine to stay awake and study late into the night. My coffee habit was being positively reinforced because I wanted to add great feelings of alertness and later the good grades I received after studying so much. Sometimes I would even have extra coffee and feel hyper – ready to party, study, and do everything. This would be the binge-intoxication phase of the addiction cycle in which excessive drug taking is being motivated by good experiences or rewards (1). The binge-intoxication phase can also be motivated by avoidance of bad consequences. Phase 2, The down side. Now that I am in grad school, I started drinking coffee every morning to get that feeling of being awake in the morning, ready to tackle the day’s problems. However, I quickly learned that if I don’t get my coffee in the morning, I feel more tired and groggy, and I get a splitting headache later in the day. This is the withdrawal-negative affect phase of the addiction cycle (1). So to avoid those awful feelings, I continue to drink my coffee in the morning. Now my coffee habit is being negatively reinforced because I want to take away the pain and tiredness that happens when I don’t have coffee. Phase 3, I want more. Also in grad school, I go to a lot of talks and conferences where I have to be awake and pay attention, so whenever I know I have to go to a lecture, I start thinking about when and where I can get coffee beforehand. I also get excited when I know there is going to be free coffee provided at a lecture. 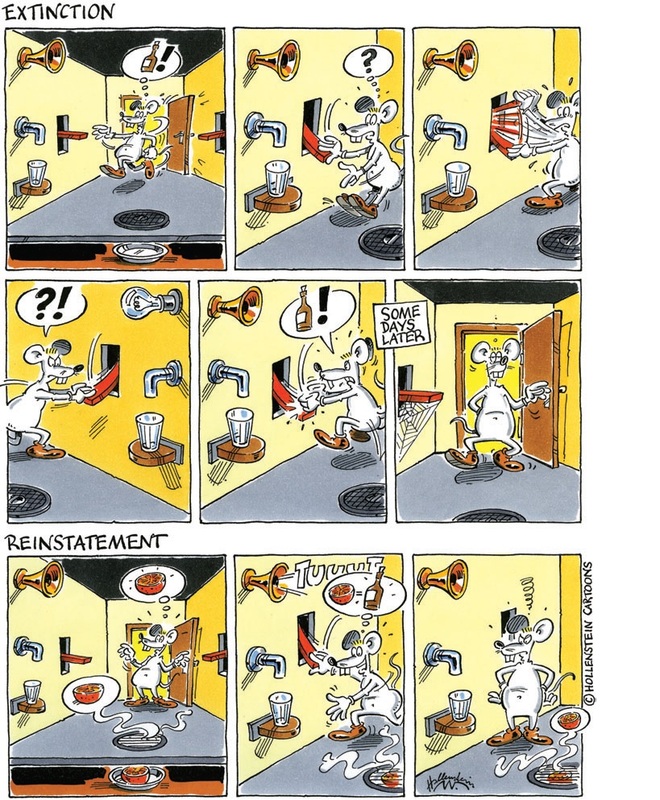 This is the preoccupation-anticipation phase of the addiction cycle during which I associate certain things – lectures – with coffee drinking (also called conditioned reinforcement [insert Pavlov’s dogs pic]). I can go through multiple iterations of this cycle: I’ll drink coffee for its benefits, then I’ll drink more coffee to avoid the headaches, then I’ll try to stop drinking coffee some days, and on those days I think about the next time I plan to go to lecture and get free coffee, and then I go buy coffee to stay awake again. Brain circuits involved in each phase of drug addiction (5). In the same way that I have learned about my coffee drinking habit, scientists can set up experiments to explore different phases of the addiction cycle. These experiments help us map brain function as depicted above to certain phases of addiction. Many studies show that as one spirals down the cycle of addiction, the brain goes through different biochemical changes that drives behavior to continue the cycle (2,3). In the article my friend read, there is an alternative theory that a person’s environment, especially social interactions, contribute more to addictive behaviors than brain chemistry (2,3). The truth is that there are multiple factors that can drive or prevent drug addiction, and we are still trying to understand all those factors. Below is an overview of typical experiments used to understand drug addiction. We often use animals, usually rodents, in experiments if we want to understand how brain chemistry changes at specific points throughout addiction. This is difficult to do in humans, but the reward-related brain circuits in rodents are similar to those humans, so we can study rodents to further explore findings from human research (5). Rats and mice are generally good at taking drugs, meaning they quickly learn how to perform a task in order to receive a drug, especially stimulants like cocaine and methamphetamine, which activate the reward circuits in the brain. Illustration of operant self-administration on a progressive ratio schedule in which the animal must press more and more times in order to receive one hit of drug (4). We can easily train them to press a lever or poke their nose into a hole in order to receive a dose of drug in an operant chamber. The animals can either drink a drug solution or get an intravenous injection through a tube that directly puts the drug into the bloodstream. Because the animal can control how much drug they get, we call this drug self-administration (4). Using experiments with drug self-administration we can ask questions about how motivated the animal is to take the drug by changing the number of lever presses (progressive ratio schedule – see picture (4) or nose pokes needed to get the drug. If the animal is very motivated, it will press many times just for one hit, whereas the less motivated animal will give up pressing the lever if it is not receiving drugs. We can also change the amount of time between presses or pokes to see how patiently the animal will wait before responding as a measure of impulsive behavior (4). The impulsive animal will not be able to wait long enough and will press the lever too soon, while the less impulsive animal will wait a longer amount of time in order to get a bigger dose of drug. Illustration of a test for impulsivity after drug taking. The animal must wait a certain amount of time before getting a reward (4). To ask questions related to rehab, the animals can go through extinction sessions, which are like the drug taking sessions, but certain characteristics, like shape and smell of the operant chamber are changed, which is like rehab in a way. During extinction sessions, the animal presses the lever expecting to get drug; however, no drug is delivered. Over multiple sessions the animal learns that lever pressing is useless and the number of times it presses the lever decreases. That rate of decrease tells researchers how quickly the animal is able to learn and adapt during abstinence from the drug. After extinction, animals typically go through reinstatement sessions to test for drug relapse. They are put in the exact same operant box where they originally took the drug, also with the same cues like lights or sounds, and they can press the lever. But this time they don’t get any drug. 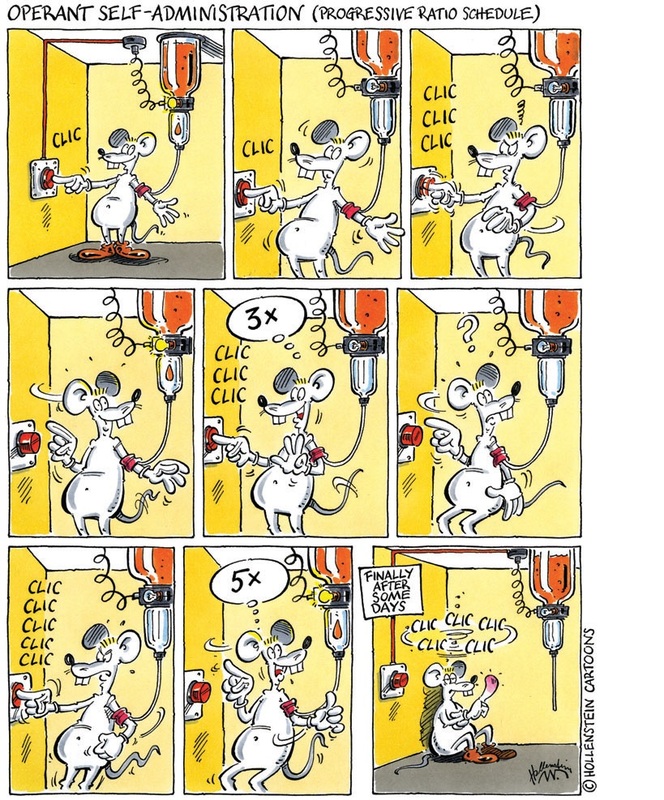 In these reinstatement or relapse sessions, the number of times the animal presses the lever is a measure of how much the context and cues drive the animal to seek drugs despite the fact that they learned lever pressing doesn’t give drugs anymore from the extinction sessions or “rehab.” Researchers can look at the biochemical changes in the brain during reinstatement to figure out the biology behind drug relapse. Illustration of extinction (like rehab) and reinstatement (drug relapse) operant sessions (4). By controlling the drug dose and time spent in operant chambers, self-administration can be a good way to study the shift from moderate drug use to compulsive, excessive drug use, similar to how humans might shift from occasional social alcohol drinking to daily bingeing. In this way self-administration has good face validity because we can relate the findings back to the human condition of drug addiction (4). These are just a few methods that scientists use for drug addiction research. 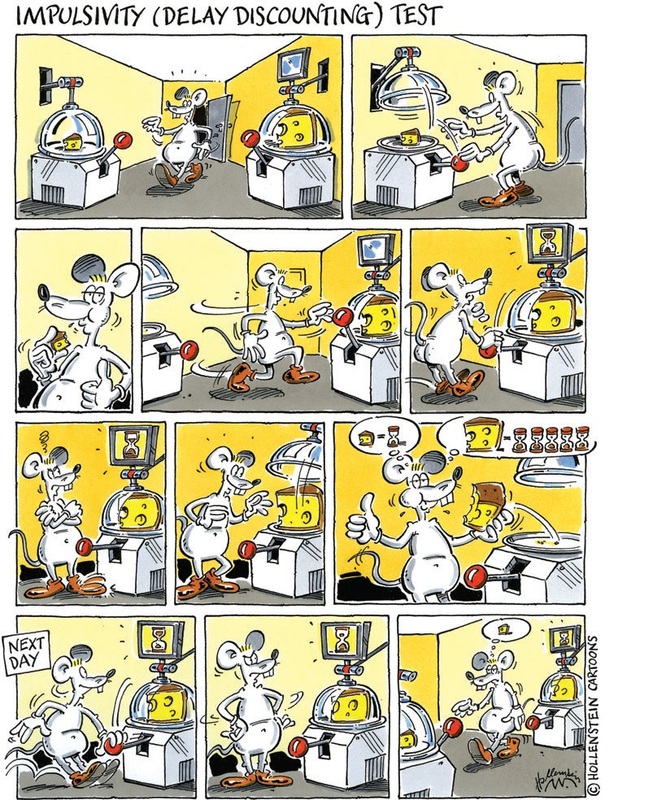 There are many other ways to understand the causes of addiction in both rodents and humans. When we read headlines, however, it is important to think about the appropriate methods being used to investigate the specific questions about drug addiction. Sometimes the study is only looking at one phase of addiction, whereas another study might want to study the long term effects of a drug long after a one-time drug exposure. The way animals receive drugs in these two cases would be different, and neither would be incorrect. Scientists think a lot about what methods to use in order to best match the question being investigated. Koob, G. F., & Le Moal, M. (2001). 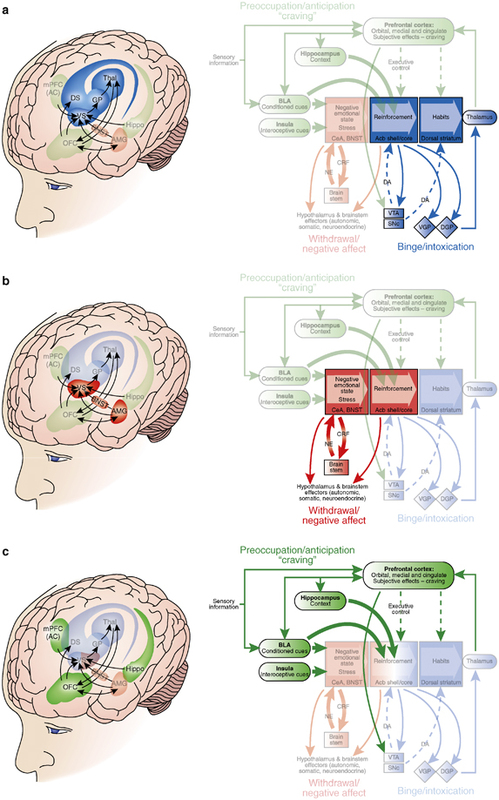 Drug addiction, dysregulation of reward, and allostasis. Neuropsychopharmacology, 24(2), 97-129. Hari, J. (2015). Chasing the Scream: The First and Last Days of the War on Drugs. Bloomsbury Publishing USA. Kalivas, P. W., & O’Brien, C. (2008). Drug addiction as a pathology of staged neuroplasticity. Neuropsychopharmacology, 33(1), 166-180. Koob, G. F., & Volkow, N. D. (2010). Neurocircuitry of addiction.Neuropsychopharmacology, 35(1), 217-238.